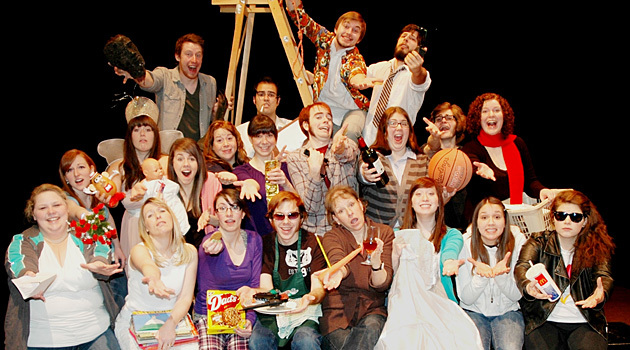 This spring, from April 25 to 29, the two theatre spaces on the Chilliwack campus of The University of The Fraser Valley will be buzzing with life and creativity, as Directors’ Theatre Festival performers from throughout the province strut -their- stuff on stage. This is the Seventeenth Annual Directors’ Theatre Festival at UFV and the attendance at this popular event has grown tremendously during its evolution from audiences of several hundred to a present day figure closer to 4,000. The festival is a fringe- style event, featuring a cornucopia of one act plays over a five day period. This year’s schedule offers twenty three productions, some by established playwrights as well as original plays by student writers. This Year’s Seventeenth Annual Directors’ Theatre Festival begins with a series of matinees and previews from 10:30 a.m. to 9:30 p.m. on Wednesday, April 25, progressing to the opening ceremony on Thursday, April 26 at 4:30 p.m. The Festival will then play through to its conclusion on Sunday, April 29 at 9:30 p.m.
Tickets for individual productions are only $5 each, with four packs of tickets selling for $15. A pass which covers all 23 productions in the event sells for only $40. For a Festival schedule with descriptions of individual productions, visit our website at: www.ufv.ca/theatre in the Directors’ Theatre Festival section.